The Bullet Series has become an icon not only for its open water prowess and downwind superiority; these boards have gained a huge following from paddlers who love cruising, touring, fitness and even mixing in a bit of surf. Stable, fun, fast and incredibly versatile the Bullet can literally do it all. The Bullet has won numerous awards for its overall performance and versatile fun. While the Bullet series is often imitated it has never been successfully duplicated. The Bullet 14.0 V2 is the ultimate downwind racing machine. This board is offered with and without the SIC F.A.S.T. Steering. The outline’s widest point has been shifted slightly forward and the rocker flattened, which provides the rider with better stability when powering up in lower wind ranges and smaller chop. You would think that straighter rocker would cause the board to pearl easily, however, the narrowed tail brings the nose up, mitigating purling and unlocking top end speed by reducing wetted surface area. 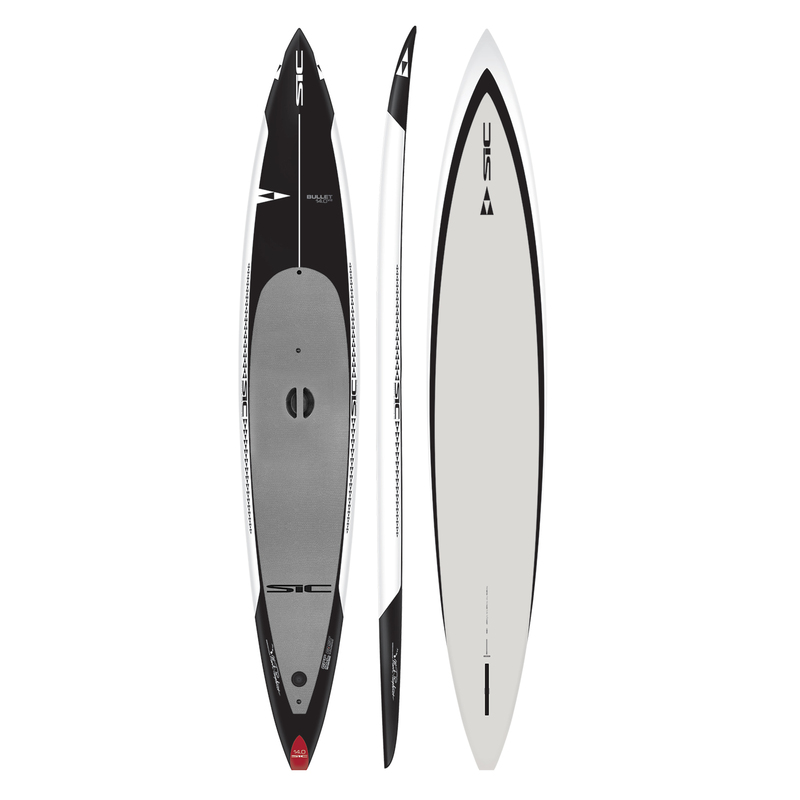 The board has slightly lower volume than the Bullet 14 TWC, but maintains its iconic full volume rails and gradual tuck to promote stability, which incidentally also reduces paddler fatigue over long races or touring distances. The mission with the ALL NEW and patented F.A.S.T. (Foot Actuated Steering Technology) was to revolutionize the same steering that SIC created in the beginning. The new system is focused on durability, reliability, serviceability, and flexibility. It features a hot-swappable tiller arm that can quickly and easily be swapped for goofy or regular footed paddlers. To improve the safety features we minimized the mechanical components, changed cables to push-rods and added multiple fail-over systems should you encounter a problem with the system on the beach or at sea. Of course it also needed to perform as well or better than the original system, which is hard to do, however, after more than 2.5 years of development we con dent that exceeded all of the key design and performance requirements. We are stoked and we are sure you will be too.